Just because it is a color wheel, doesn’t mean that it is a good (accurate) color wheel! You would be surprised how many bad ones that are out there. These are fairly good examples of a decent color wheels. For the untrained eye, all of these color wheels look, well, like a color wheel does… or maybe we think should look. However, not all color wheels are alike. 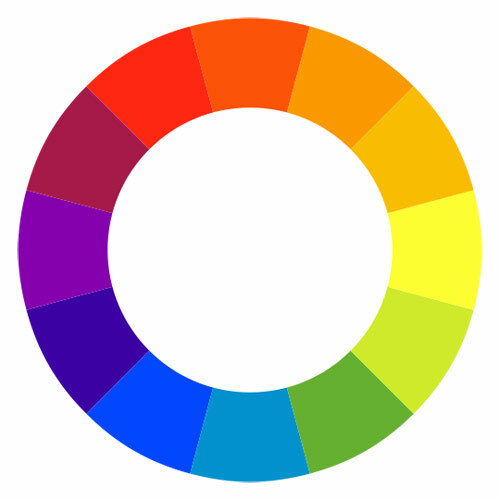 Infact, it is a lot harder to find a really good color wheel than one would think. It may take actually making a color wheel yourself for one to understand just how tough making a really accurate one can be. The places that i find get into trouble the most are between the yellow and yellow-green first. It is really quite difficult to get yellow to step smoothly into green due to it being the lightest color in value on the color scale. So, not too surprisingly the other place i often find gets botched is in yellow to yellow-orange. Again, it is so easy to just take it from yellow into a much more valued yellow-orange. Sometimes they do great throughout the whole green to orange section but then comes blue and it goes all choppy again. In a color wheel, no one color should look largely different in value to either color next to it. There should be no big steps from one color to another and no big blocks that stand out apart from the whole wheel. This is my little lesson on choosing the right color wheel. You never know when you might need this kind of in depth color wheel knowledge! Go ahead… show up your friends now that you know what a good color wheel should look like! It can become a game like it does me… the search for accurate color wheels… Like spotting a dodo bird almost! This entry was posted in social issues, Writings from my world and tagged art, beauty, bluepearlgirl, color, color theory, color wheel, design, paint, pantone, postaday2012 by bluepearlgirl's world. Bookmark the permalink. I know. I used to work for Benefit cosmetics way back in the day when they only had botiques and had not gotten into Dept. stores or been bought by Estee Lauder. I think that they were the real first to start naming their products funny things… like “touch me, then try to leave cream”. I know. I used to work for Benefit cosmetics way back in the day when they only had botiques and had not gotten into Dept. stores or been bought by Estee Lauder. I think that they were the real first to start naming their products funny things… like “touch me, then try to leave cream”. I should say that at that time though, their lipsticks were just numbered. That was back in the stone age! Pingback: FLUTTERING FOR FALL « Lips, Hips and Fashion Tips!